Here are the trophies of our top 3 teams. New season ahead hopefully will be an exciting one. Porto starts the season as the champion but not many things changed since last season, very important players left again and little to none exciting signings. Last season we were under the FFP which limited our transfers a lot, Sérgio Conceição had to rely on the players that were out on loan to fight for the title after we bought only a 3rd option GK in the summer market and a couple of garbage players in January. Marega, Aboubakar, Ricardo and Sérgio Oliveira returned to the club and were crucial to add new silverware to the museum, after all 4 years have passed since the last trophy, the worst spell since I´ve been born, I´m 31 btw so you get the picture. Now that the new season arrived and after a very slim market last year Porto supporters were expecting a decent summer market but so far it´s just a joke, so much that the coach came publicly telling that he needed new players, last season after February most of our players were either injured or with severe limitations with no one to replace them, that almost caused us the title. So far the board bought 2 Cbs, 2 RBs and a midfielder, that´s just to replace Marcano and Reyes as Cb and Dalot and Ricardo as RB, one of those RBs and the MC were so bad that our coach send them away after less than 2 weeks in the club. Benfica lost the opportunity to get 5 titles in a row joining Porto in that accomplishment. Their president sold a lot of key players without buying proper replacements and their season was terrible, no titles 0 points in the CL for the first time and a bad performance in the cups, Jonas was able to keep them in the fight for the title until the very end and Benfica managed to capitalize on a Sporting slip in the last game to secure a 2nd place. Apparently the president learned from their mistakes and are now building a very solid team , the best in the league IMO. Grimaldo and Jonas were going to leave but apparently are staying, they bought a much needed GK that seems decent so far, Rúben Dias appeared last season and is a solid player to fix their CB problems. They needed a good attacking RB to have a great defense but Andre Almeida is OK and enough for the national competitions. Fejsa is the key players in their midfield and is very important defensively, Pizzi is also starting the season very well. They also have been giving playing time to one of their best prospects Gedson and the kid has been doing well. Krovinovic will return in a few months after a very bad knee injury and will also add a lot of quality to the team, there´s also Ramirez that have been heavily linked to return to the club and if that´s true they´d have an unbelievable depth in the midfield. In the attack not selling Jonas was the best thing they could have done since he´s capable of scoring 30+ goals every season, some back problems are limiting him but he still pulls off amazing numbers. Adding to that they also got Ferreyra for free from Shakhtar that I think suits the team very well. Rui Vitória isn´t a great coach but with this team it´s almost impossible not to have a great season. Sporting is slowly working on his way back after their lunatic president made like half the team cancel their contracts. After the board voted him out they brough in, until the next elections, one of the most charismatic presidents from the club in the 90s and the guy is doing amazing, he managed to be able to bring back most of those players, Bruno Fernandes and Bas Dost being the most important ones since Rui Patrício, Gelson and William had already accepted offers from other clubs. They bough a coach that´s sort of a meme in Portugal because he´s always called when one of our big clubs is in deep trouble just to be sacked after a season if he´s lucky enough. Nani is back and seems strong and confident for the new season. The also managed to retain Coates and Mathieu who are 2 solid CBs. Sporting also have, as always, solid young players that will take this opportunity to shine, if the players they bought to replace Patrício and William perform well they´ll manage to turn the club around in 2 months which is incredible considering how they finished last season. Last edited by Azul; 24 Aug 18 at 16:24. Benfica-Sporting is tonight for anyone interested it’ll be an exciting match, Jonas and Bas Dost are injured and will not play. I was going to post a preview of the expected teams and my view about them but didn’t have enough time yesterday and today I’m on my way to a quick visit to Spain so here’s the reminder. Shame it's not 2 hours later. Inter is doing something wrong in that case. Sporting - Porto will be played tomorrow if anyone is interested, it will be a very interesting game I´m sure. Sporting needs to win because they´re already 8 point away from the top spot, Porto goes to the game with an astonishing 18 wins in a row in all competitions but imo the team haven´t been playing good at all in the last 5/6 games, most people are giving the game for Porto for sure but I´m very skeptical. I´m not sure if I will be able to make a preview of the current moment of both teams going into the game in time, because the game is at 15:30 here. In the next days I´m going to post the usual general review of the league so far, European performances of the top teams, cups and also include some of the players that have been shinning in this first half of the season, I was going to do that during christmas vacations but life happened. It´s the middle of the season in Portugal so I´m gonna give my opinion on the season so far. 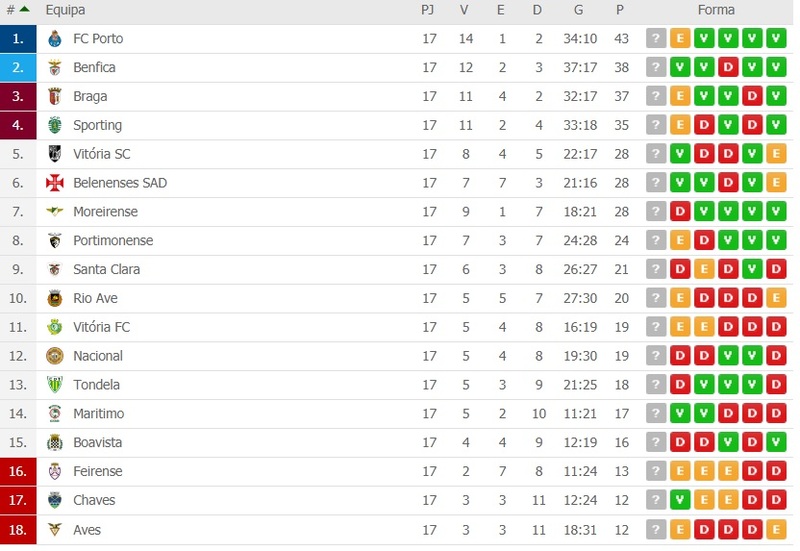 In the top of the league comes Porto, followed by Benfica who recently sacked their coach, Braga is doing a good season again and Sporting, who also sacked their coach, is close. Porto, Benfica and Braga are very close in top of the league, Sporting considering the last Summer is doing better than I expected. Porto recently drew against Sporting, the game was one the worst I´ve seen recently so I´ll just skip that, ending a sequence of 18 consecutive wins in all competitions. Like I said before even though that and the position on top of the league makes it seem that everything is running smooth the team isn´t showing the same exciting football they showed last season. The players seem tired and due to recent financial problems apart from the 14 players that play all the time the rest is way below our level, to put that in perspective Tuesday we played with 6 players that usually don´t play against a mid table team from the 2nd Div (Cup match) and only won in extra time. Danilo recently got injured and is going to be 1 month out and that´s a big blow for us, Brahimi is being close to be KO for the past 3 matches and we´ve been playing him with lot of limitations, if he stops as well we´ll have a big problem ahead, Aboubakar isn´t likely to play intil maybe the last month of the season. About players, Militão has been proving to be an amazing signing, like I said after the 1st Cl match, this guy is the real deal, amazing player, there´s no way he´ll be here next season playing like this. Telles is super influential but is far away from his performances from last season. We´re also struggling in the RB position, Ricardo leaving for Leicester and at the same time losing Dalot to United left a big gap in that spot, we´ve been rotating between Maxi, who´s way past it, and Corona, a pure RW that is trying his best when playing there. Now with Pepe on the team we´ll more likely play with him as CB and Militão as RB. What do you think of Joao Felix Azul? I think he's a big talent, will go for big money this summer. Sorry I missed the post. I would probably have talked about him in the last post but I stopped halwaythrough the post and forgot to update about the other teams. He´s a great talent but the media is hyping him too much imo. He´s a very versatile player, he has good technique, agility and off the ball movements, which is his key strength for me, the way he appears to be able to get the ball in the box unmarked or in anticipation is unreal. He´s best at playing behind another striker and having a free role to wonder around the attack, he also finishes very well which is rare for such a young player, has a powerful but also precise shot. He needs to bulk up fast, he´s on his way to 20 and Benfica should have worked on that department in the last years, it´s his biggest weakness for me. Like I said in the beginning I compare the hype that the media is doing about him to the same they did about André Silva, who I also said was nothing special from the beginning, it´s way too soon to be talking about him as the savior of the nation but keep in mind that imo even in this early stages he´s looking more impressive than André Silva ever did, I believe that if he continues to develop well he´ll turn into a fantastic player. Sporting won last night 1-0 against Benfica to reach the cup final (vs Porto) with this beauty scored by Bruno Fernandes, with his weak foot. It´s his 26th goal of the season, adding to his 14 assists, with Dost being injured a lot this season Bruno has been carrying the team on his back. Keep in ind that he´s a midfielder, 26 goals in insane! Being only 24 I don´t see Sporting being able to keep him another season. Udinese sold him for 7m a couple of seasons ago. Sampdoria then sold him for 10m or something. Sporting probably won't let him go for anything under 40m. Thanks for the post Azul. The hype surrounding him just increased like crazy after today's performance. Hat trick and an assist vs. Frankfurt in the Europa League!